Home » Team » Kristina Russell, B.Sc., D.V.M. I graduated from the Western College of Veterinary Medicine in 1994 after a 4-year bachelor of honours degree in Biology from the University of Winnipeg. I moved to London in 1994 and after working at various veterinary hospitals in the city, I opened a house call practice. The house call practice grew to a point where I was unable to take care of all my patients when they needed me to. I needed a home base and Stoneybrook Animal Hospital became that home base. I purchased this business from Dr. David Yates in 1998 and have combined his patients with my own, to finish with the most awesome place I could ever work. Every day I get to work with awesome people and talk with great clients, who really love their pets! My best part of being a veterinarian is that I can help someone give life back to his or her animal companions. I can help ease the suffering and can extend the quality of life by using my experiences and my education and training. 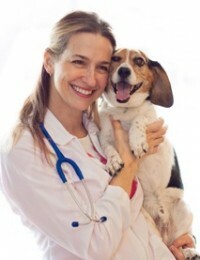 It is particularly rewarding providing veterinary care for an entire pet’s life. It’s like I have an extended family of pets throughout the city. I enjoy taking part in additional training to further my abilities. We were the first veterinary hospital in London to offer both the CO2 Laser for surgery and therapy laser and have enjoyed having hands-on training from the American Laser Society. I have studied and graduated as a Level One Certified Laser Clinician in 2006 from the Veterinary Surgical Laser Society, Ltd. Poolesvile, MD. My daughter Kaylissa helps out in the clinic now as a part time receptionist and assistant. My personal pets at home include Benny the Rat, Sierra and Prin the kitties, Paxton the pocket beagle, and the step-dobermans, Roxy and Thunder. It’s a full house!